Alan Klapmeier, current Chairman, ex CEO and joint founder of Cirrus Design (now known as Cirrus Aircraft) today announced that he was putting together a team to secure funding and buy the SF50 jet project from Cirrus Aircraft. The announcement was made at M7, the annual event that brings hundreds of customers and their aeroplanes back to the factory in Duluth. Klapmeier has engaged Merrill Lynch and is positive about being able to raise the necessary finance. He estimates that it will take two tranches of $60m each in order to develop, certify and bring the SF50 to market - by the way, it could be called the Aegis jet if Klapmeier is successful. While no deal has been done, I understand that the intention is for the new company to take over the liability for the existing deposit holders, but not for the pending L3 lawsuit. L3 is claiming a total of $21.3m, $18.3m of which relates to a cancelled contract for 75 SmartDeck systems. At the same M7 event Brent Wouters, Cirrus Aircraft's current CEO, also spoke about the jet project. Interestingly, while acknowledging that Klapmeier had approached the board and Arcapita (Cirrus Aircraft's main shareholder) he went on to say that he saw the SF50 as playing a key role in the future of Cirrus Aircraft. He also went on to say that he saw outside capital coming into Cirrus Aircraft in order for the existing company to complete development and certification as quickly as possible. 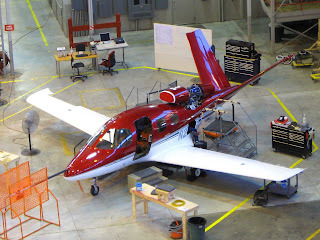 The next few months promise some interesting times, particularly in the Cirrus Aircraft boardroom, or at family events.